I'm a self-employed web designer & photographer since 1998. But that's all business and this blog is all about my crafty hobbies! 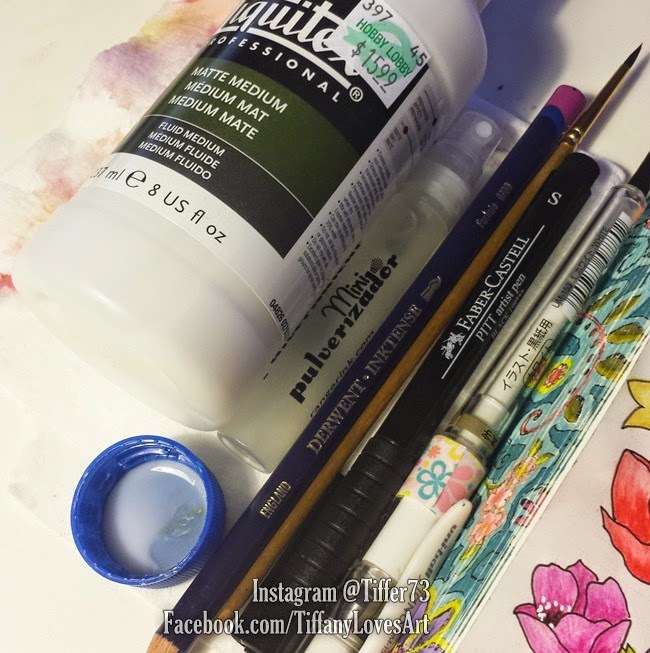 Throughout this blog you will find things like watercolor painting, paper crafting, stamping, card-making, copics, my own hand drawn digital stamps, beading, cooking, gardening, photography, photoshop, the antics of my 4 legged children, Emma & Francie! Sign up with your email and I'll let you know everytime I add a new digital stamp, photo, paper craft, or painting! Don't forget to click the link inside your sign up email from Feedburner to complete the subscription! 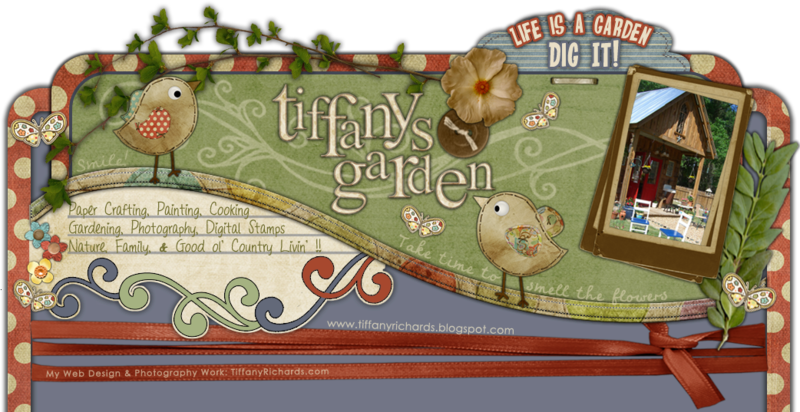 Join Tiffany Doodles Flickr Gallery to view & upload your projects made with my Digis!! Copyright: All images and articles are Copyright Tiffany Richards. If you would like to use one personally, just email me. If you would like to use one commercially, please visit my business site at TiffanyRichards.com for my Terms and Conditions. FAQ: This blog is just for fun. I am a self-employeed web designer and photographer, please visit TiffanyRichards.com for inquiries. Around the garden I use a small point and shoot Canon. I also use a Canon D40 with a wide variety of lenses, lighting and accessories. I'm addicted to Lightroom, Photoshop and Dreamweaver. I have a 17" Dell XPS m1710 and 3 other Dell laptops. A Dell 24" monitor. 2 Epson printers, one of which is a wide format. HP scanner. Three external hard drives at 600gig each. Any Questions? Okay, now, my crafting supplies include: Cricut Expression & 5 cartridges, Slice & 6 cartridges, Sizzix Big Kick, Bunches of Nestibilities and cuttlebug emobossing folders, 2 Xyron sticker makers, Tonic paper cutter, 279 copic markers, 100's of papers, stamps, punches, ribbons, embellishments, glitter, embossing powders, and too much more to mention! Feel free to ask me any questions about anything you've seen on my blog! I made a travel watercolor palette to hold 85 of my favorite colors!! 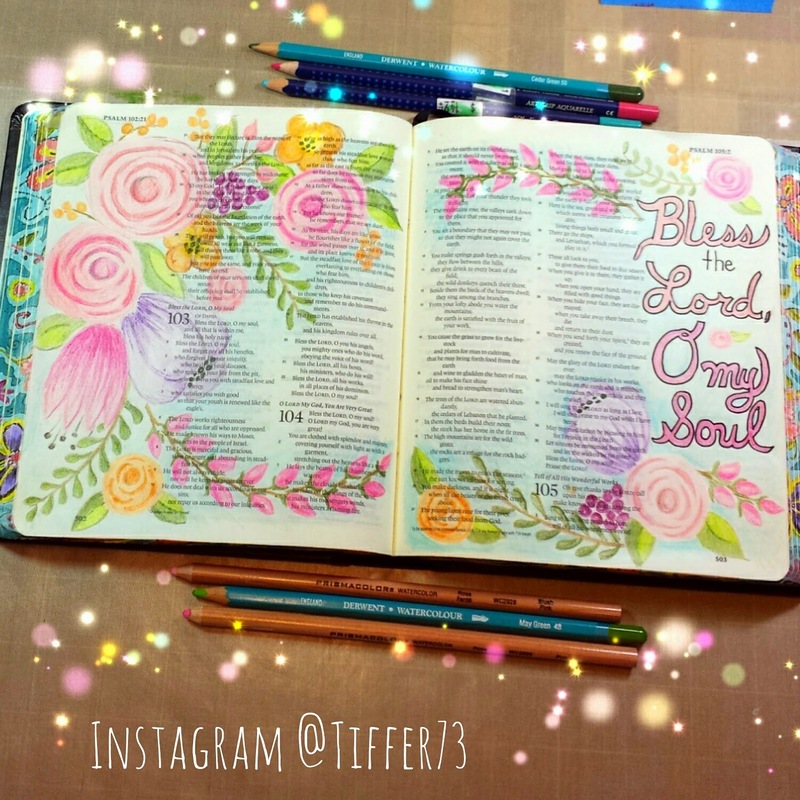 www.TiffanysGarden.com my crafty personal blog where you'll find my watercolor painting, bible journaling, Distress Ink stuff and organizing my craft stash! www.TiffanyDoodles.com where you can find all of my drawings that you can color yourself! 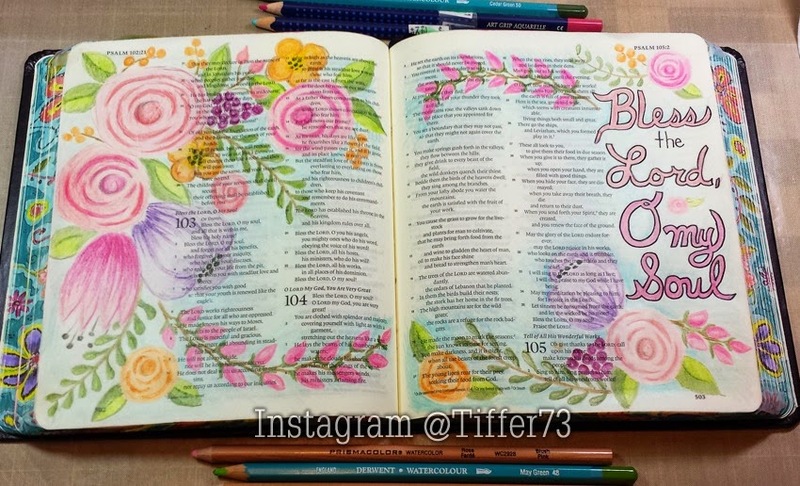 @Tiffer73 Instagram - ALL of my art and craftiness!! Distress Ink for Watercolor Facebook Group If you like to use your Distress Ink in a more traditional style of watercolor, then come join our group! 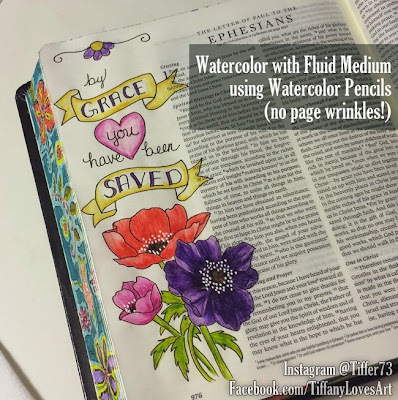 Normally, if you want to do any "watercoloring" on your thin bible pages you need to lay down a full coat of something like gesso, matte gel medium or the fluid medium and then put your color on top of that! Well, I may have found a way to lay down your color first and then use your medium last! First of all I drew my image with my waterproof pen! 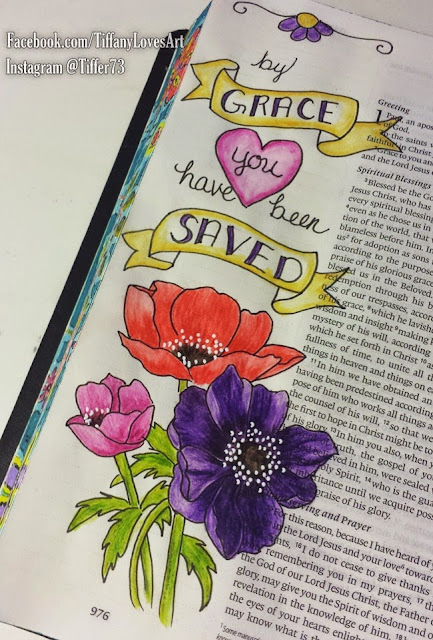 Then I colored my image with my Derwent Inktense watercolor pencils. 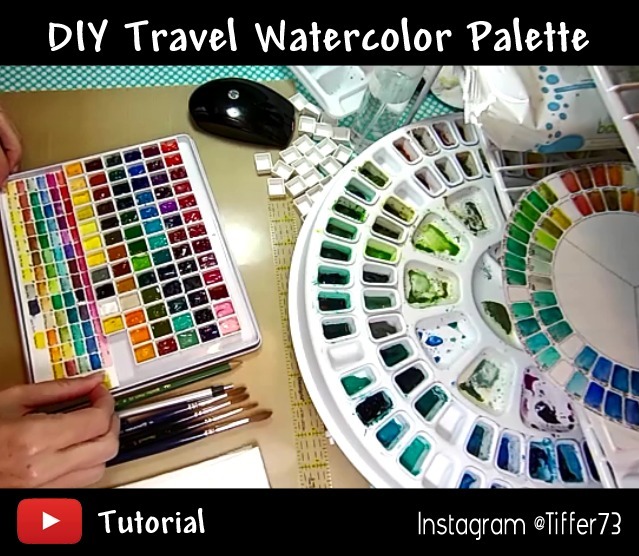 Any watercolor pencils will do! 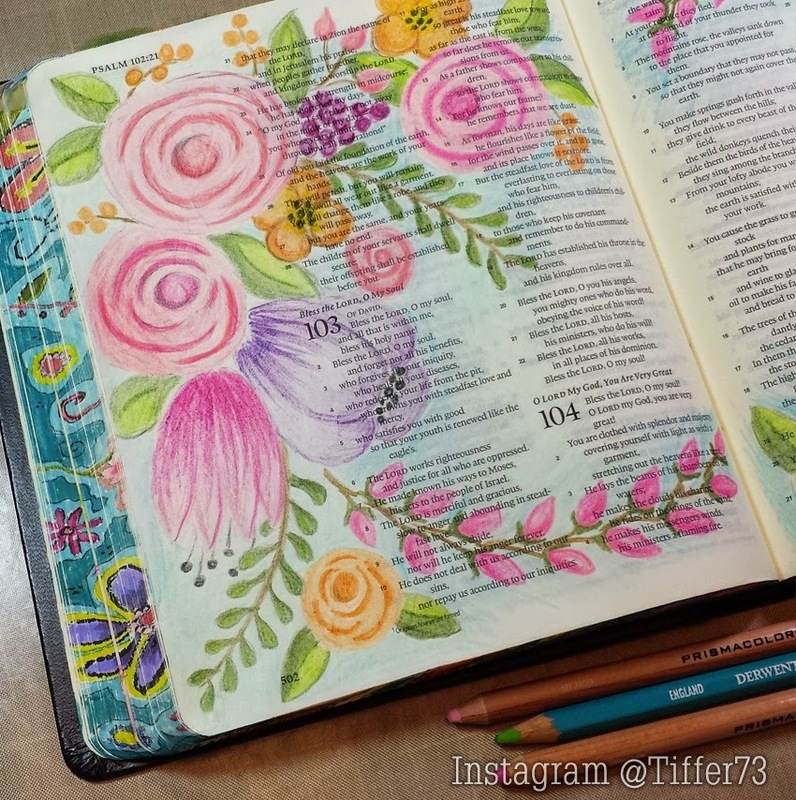 The inktense are just so vibrant! A note on coloring with the pencils, color lightly where you want the color lighter and color heavy where you want it darker. Next step is the fun part! I got a bottle cap and added 3 drops of Liquitex Fluid Matte Medium, then I added 2 squirts of water from my mini mister. This stuff goes a looooong way and even 3 drops was more than enough for these small items to paint. I got a small paintbrush and mixed the water in really good. Then started painting. When painting start in the the lighter areas and work your way into the darker areas. If you start in the darker areas and go towards the lighter areas you will pull the dark in and cover up your lighter areas. So be sure to start in the lighter areas first!! After dry, the last step was using my white gel pen to make some dots in the middle of the flowers! All done!! 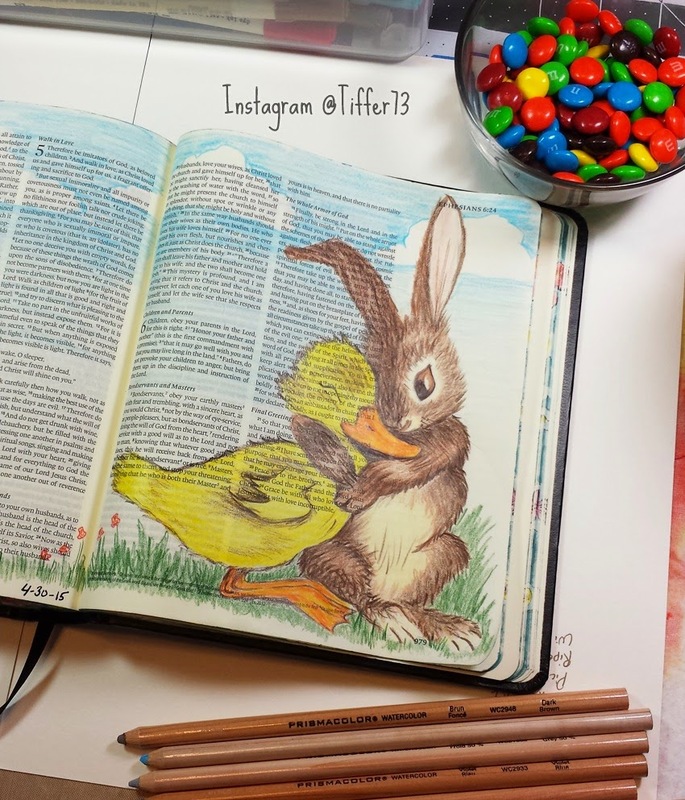 Be sure it is completely dry before you close your bible! 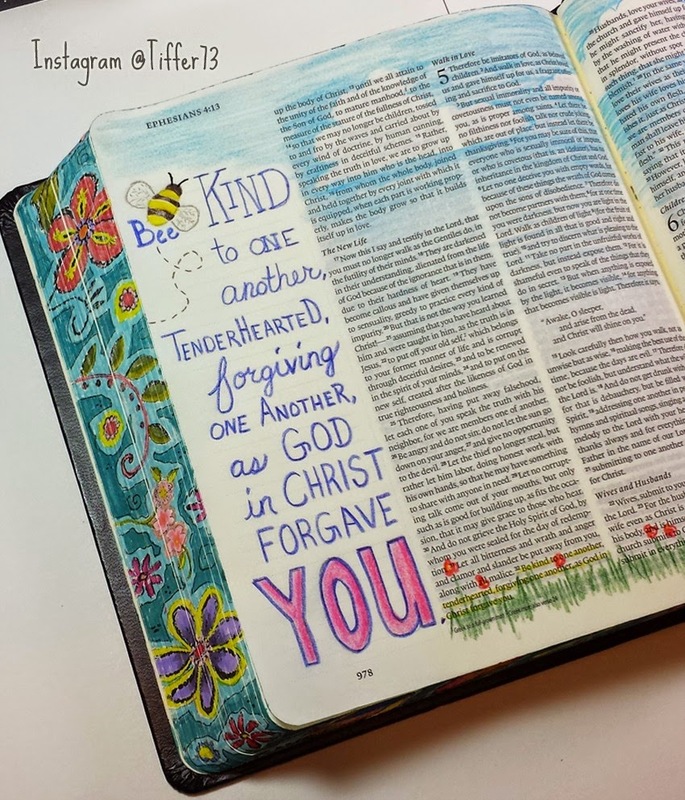 If you are interested in the Documented Faith facebook group, everyone is welcome to join us! 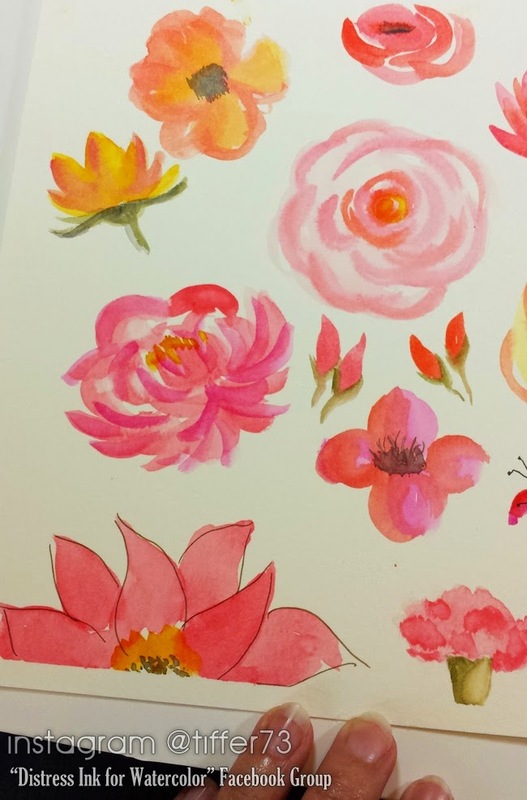 Oh, and if you enjoy using Distress Ink in a more traditional style of watercoloring, then you've got to come over to my Facebook Group Distress Ink for Watercolor! We'd love to have you join us! Ephesians is full of beautiful verses about love, so many artful images come to mind when ready through this book. 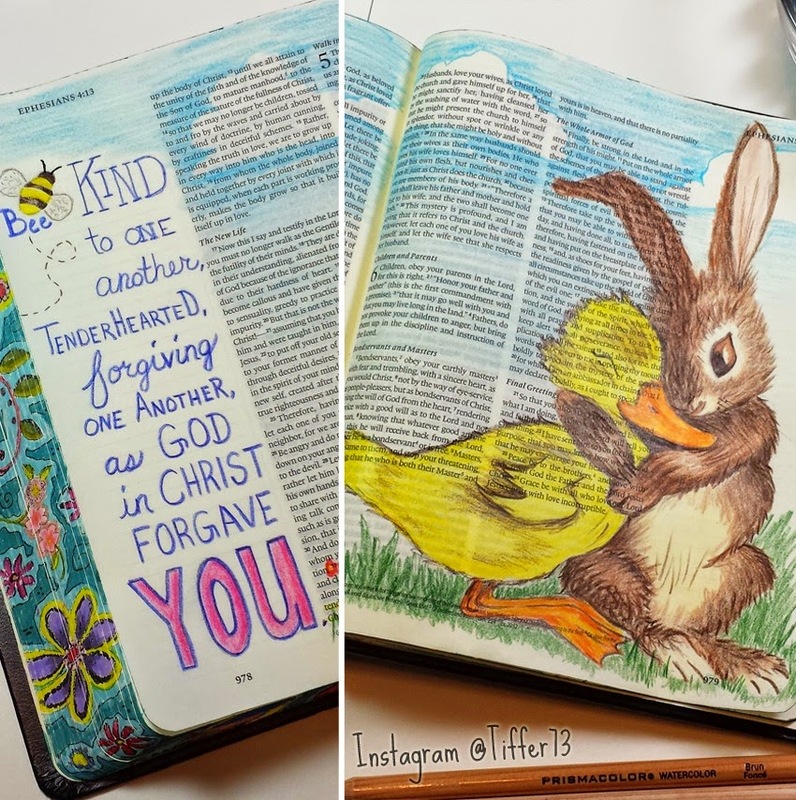 Not long ago I came across this image of a loving bunny and duck from a Little Golden Book story and I just thought it would be perfect for this verse! I drew these little guys freehand just looking at the image while riding in the car (my favorite traveling pass time)! I used my Prismacolor watercolor pencils, but I did NOT use any water here. I really love vintage images and art so I think you'll be seeing a lot more of this style coming from me! 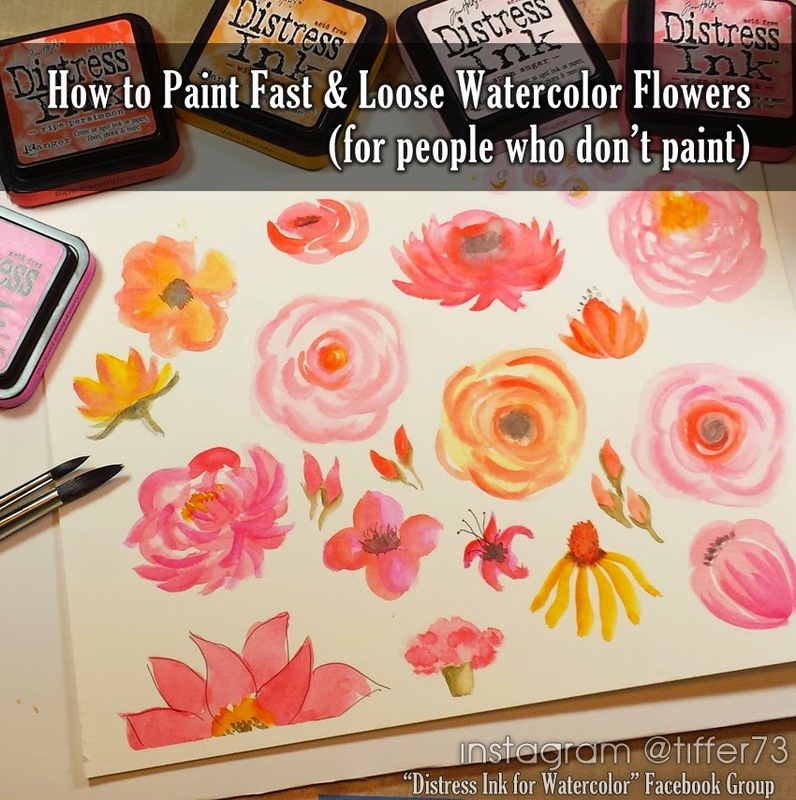 How to paint fast & loose watercolor flowers, for people who don't paint!! Seriously, anyone can do this! 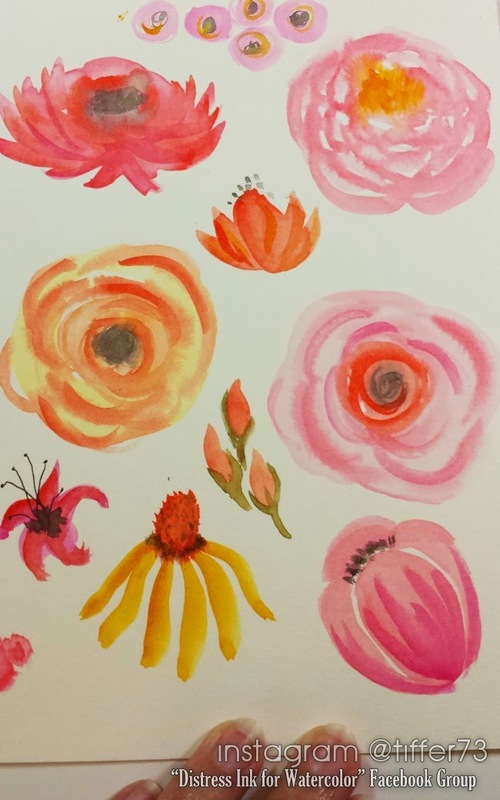 With basic shapes and simple swishes of your brush you can create these fun and whimsical flowers in no time! They are not perfect and the best part is.... they don't have to be! I made another video for you! Please bare with me as I'm still learning this video tutorial stuff! 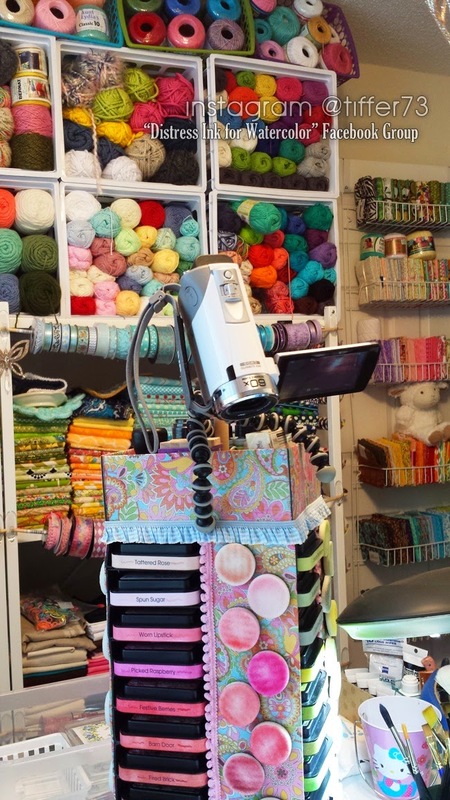 Here is a sneak peek of my video camera setup! I'm using the top of my Distress Ink pad spinner along with my gorilla tripod to wrap the legs around it to hold it on! I really need to come up with a better plan. Is there anyone out there with some tips for me? 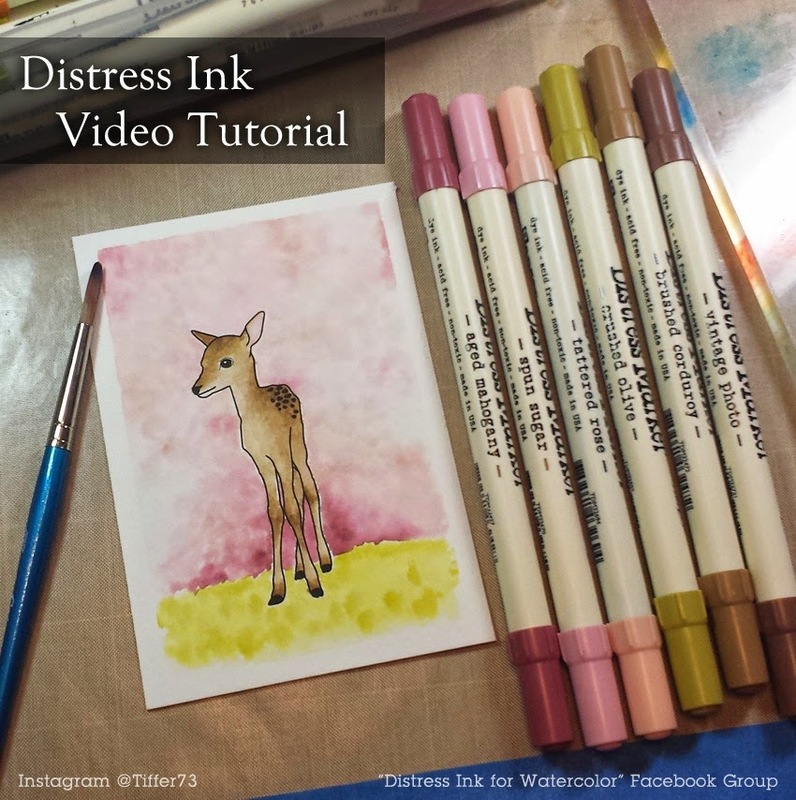 Oh, and if you enjoy using Distress Ink in a more traditional style of watercoloring, then you've got to come over to our Facebook Group Distress Ink for Watercolor! We'd love to have you join us! 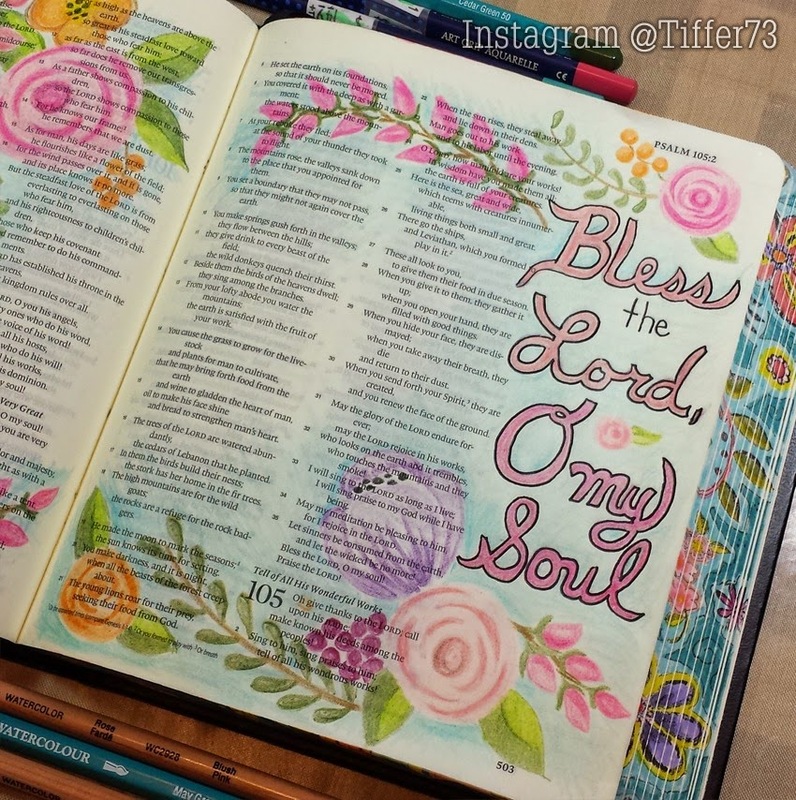 "Bless the Lord, O my Soul... oooh oh oh my soul, worship His Holy name.... Sing like never before.... oh my soul" I've had this song stuck in my head for days so I thought I would put it down on paper and give it some color!! I used a variety of colored pencils and doodled out some flowers! My first ever video tutorial!! I wasn't brave enough to talk through it (yet) so I played some happy music and displayed tips on screen. I painted a cute little fawn with a pretty pink background! I wanted to keep it simple to see how it would go!! I admit, it was kinda fun!! I'd like to ask your opinion on video editing software (for Windows 7). I used the free Windows Movie Maker software to make this video, but I feel like it was limited in it's features. What's your favorite video software? I'd like to do some investigating and find something new!